The property includes : large natural water swimming pool with walled terrace, 9 en-suite double bedrooms (many south facing) and 2 with separate sun lounge, parking for up to 132 cars, 2 separate downstairs bathrooms, lounge with satellite TV, dining room, breakfast room and 2 circular turret bedrooms with all round views. Only 20 minutes from the beaches and 1,5 hour to the nearest airport. This property is a beautiful and luxurious south-facing villa set on 15000 square meters of land. It is set in a idyllic location with panoramic views over the valley below with almond and olive trees, towards the local mountain range. 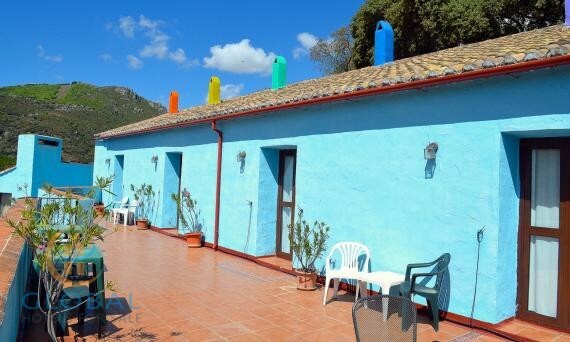 Totally secluded, it is ideally situated for a quiet and relaxing holiday, and has stunning panoramic views of the pine clad hills towards the mountains. It is situated within walled landscaped gardens with mature oak, palm and pine trees. It is accessed via a gated entrance leading onto a driveway with ample parking area. This magnificent property offers peace and tranquility combined with stunning views of the surrounding countryside and mountains. An ideal base from which to explore the natural beauty of the surrounding area with its' dramatic landscapes and enchanting valleys. There are many different paths nearby which will appeal to those who enjoy walking. Hawks, and occasionally eagles can be seen in the area. Quite simply, a haven for walkers and artists alike or for those who want a complete break. For the more energetic guest, horse riding and golf are available locally.